Before diving into the recipe, we want to welcome you all to the new home of Constables Larder. Thank you for joining us here, and please let us know what you think. If you are an RSS subscriber to the old blog, please unsubscribe that one and sign up here (although if you are seeing this post, it means it’s working automatically, miracle of miracles). Spring is finally starting to emerge, and my palette is very Mediterranean-focused. Last weekend, this manifested in the form of a galette — essentially an onion tart with the addition of zucchini, olives, garlic, and tomatoes. Instead of a pâte brisée, I decided to try a Provençal pastry (pâte à l’huile d’olive) which Richard Olney describes in Simple French Food (my new flame). It is easy to make, quite tasty, and has a rustic personality and texture. As you can see from the picture, I almost completely covered over the top of the galette with folds rather than trimming the rolled pastry closer to the edge. I think next time I would either trim the pastry more aggressively or make a full pie/pouch (see below) to avoid the problem of over-thick pastry at the folds. However, there is a primary advantage to this big-fold approach: it is really easy to eat with your hands! Place the flour, salt, egg, olive oil and water in a mixing bowl. Mix it together with a fork, and then knead it together with your knuckles until mixed through. Form into a ball, cover the bowl with a towel, and let rest for at least an hour. On low heat, melt the butter and a splash of olive oil in a large saute pan. Saute the sliced onions, stirring occasionally, for 20 minutes, letting them turn a nice golden color. Add in the zucchini, olives, garlic and herbs and saute for another 15 to 20 minutes. (Note: A great method for pitting greek olives is to crush them with the side of a chef’s knife; the pit becomes quite easy to pop out.) If the mixture gets too dry as you saute, you can add a little white wine or dry vermouth, but do not let the filling get too liquid. Taste for salt and pepper, then let cool. As the filling cools, preheat the oven to 375F. On a well-floured surface, roll out your pastry. Trim the pastry so that it is about 12 inches in diameter. Cover a large baking tray with parchment paper, and then move the pastry onto the parchment paper by: gently fold it in half, fold in quarter, move to parchment paper, then unfold. Spoon your now cool filling to the middle of the pastry, dot the top with slices of tomato, and fold the extra pastry up and over at a slight angle. 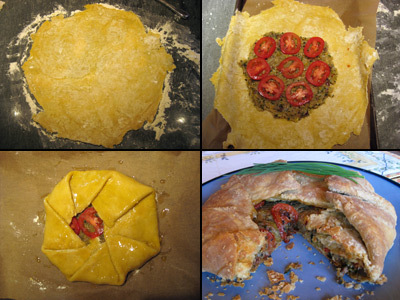 * Brush or smear (with your fingers) the surface of the pastry with olive oil. Bake for 50 minutes until the pastry is golden brown. *Note: if you want to make a pie/pouch, you’ll need to divide the pastry in half and roll out two pieces. Place the filling on the bottom piece, and then cover with the second. Press the edges of pastry together with your fingers, and then roll the edge up and inward, creating a thicker ribbon of pastry around the edge. Press down around the ribbon with the tines of a fork. Smear the top of the pastry with olive oil before baking. Congrats on your new wonderful site! The feed still works, so that went smoothly! This galette is up my alley. I may have to copy you and make it this weekend. I will use Olney’s book more often. Why don’t I? The RSS seems to be working fine. Congrats, the new site is beautiful. Your provencal galette sounds delicious. I am now imaging other fillings which can be used. I am bookmarking it. Yum, that is my kind of meal once the fresh veggies start rolling in. The site looks great! Love the new layout … been thinking about some changes myself, but can’t seem to get things together yet! The galette sounds delicious…I was just sitting down to think of what appetizers/meze I would serve next week on Easter and this sounds like a great one. Love the new site! Nice job w/ it. I love a savory galette… it looks wonderful! I love the new site! I love Richard Olney! I love your galette! Seriously, the site looks great. Love the new redesign of the site and the galette. Will definitelty give it a try.